Format VideoPosted in Videos | Tagged black magic, chelsea denofa, Chris Forsberg, Nitto Tires, Vaughn Gittin Jr.
To be fair, even though the deck above only references the trials of driver Odi Bakchis and his Falken Tire Nissan 240SX during Round 4 of the 2017 Formula DRIFT Championship, his wasn’t the only entry at Wall Speedway to suffer technical issues; there was plenty of that to go around. There was also a ton of insane driving in New Jersey, with the inter-webs buzzing afterward about the seemingly never-ending stream of unbelievably close tandems. A bunch of drivers clearly found their balls at Round 4, taking so-called “chase craft” to remarkable new heights. The event got underway Friday with qualifying, as Chelsea DeNofa in the BC Racing Mustang RTR laid down an impressive 96-point pass out of 100, shooting to the top of the order — probably the best he’s done thus far in his new-for-2017 ride. DeNofa, Ryan Tuerck in the Gumout Nameless Performance 86, Justin Pawlak in the Roush Performance Mustang, Kristaps Bluss in the HGK Racing E46, and James Deane in the Worthouse Drift S15 all earned Top-32 byes due to qualifying so highly (meaning the event only had 27 entries for the 32 cut). 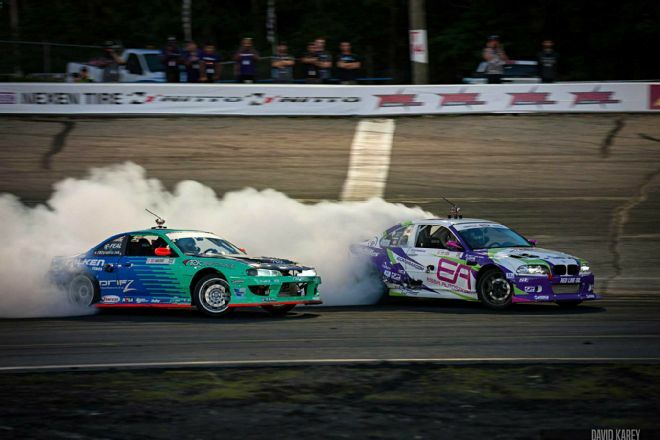 Orlando Speed World is one of our most preferred Formula Drift championship stops, although it looks like a “simple” transition layout after its long banking is a challenge for all teams. It is also the first date of the interesting category PRO2! Here Travis Reeder shows us that you can finish the course even if you lose a rubber. Luis Lizardi would reach the top position of the classifier in the PRO2 but would fall in the first round of qualifiers of the top 16.